We Follow Through With What We Offer But What Do Other’s Say About Us? Want to share your own experience with us? Send us a note to let us know what working with LCK Properties LLC has been like for you. ” We got your information throught the mail and we contact ya. Everything went by very smooth. You did everything you said you’ll do. We’re very very happy with how everything went down and it was done.” 2 week closing 🙂 Took care of all their closing cost. 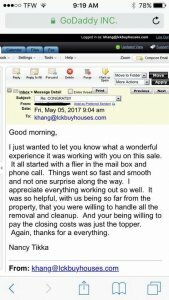 Email we got from the seller after closing, who lived far away from the property. Wife passed away and the house is in bad shape. 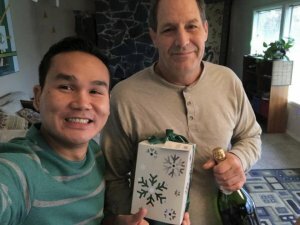 He found the letter we send him and gave us a call…We were able to buy the property “AS IS” and pay for all his closing cost! Here what seller gotta say about selling us his house.